Safely end the dangerous practice of texting while driving with tXtBlocker. Just log in to your account and control when, where and how your cell phones can be used. 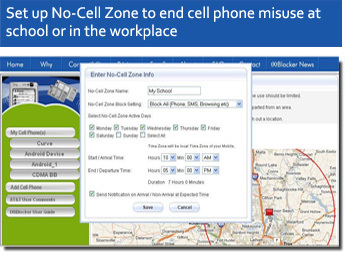 Set up "No-Cell Zones" to disable or limit functions like texting in schools or around workplaces. You can also track a phone's location in real time and monitor driving speed with our online map interface. Phones can always make calls to 911 and with your own preset safe list numbers. Click here to learn more about laws in your state. Click here to take the New York Times' online texting while driving test.